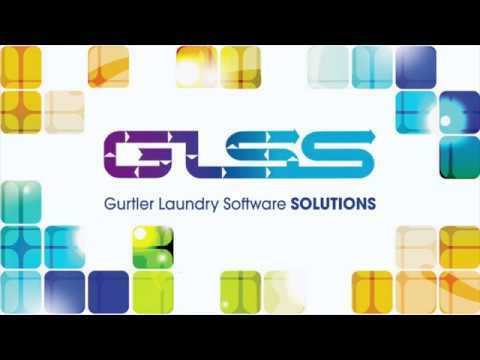 GLSS Electronic County Systems (ECS), is a dedicated solution of customized hardware and software which allows direct interfacing to the laundries soiled sorting process. Our system provides total flexibility allowing soiled linen returns to be automatically counted via the various methods known as counting frames, barcodes and RFID. GLSS eliminates the need for third party applications and maintains greater data integrity and seamless integration to GLSS core modules. Finishing staff is able to monitor their production rates via the efficiency dial on large flat screen moniters located at each work area. The information displayed is updated every 60 seconds allowing the staff to make any necessary adjustments to maintain on track to achieve their production goals. 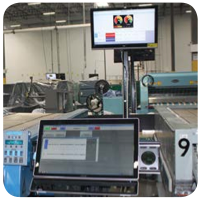 An easy to learn log-on touch screen monitor allows staff to select their production classification quickly. Any pause in production can be easily entered for breaks, lunch, equipment issues, and any other easily programmed entries. 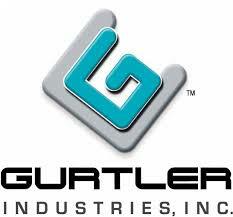 The maintenance team can also log-on to record equipment down-time issues and the resolution. 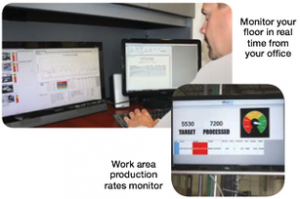 Management is able to view the dashboard screens as the associates view them on the floor and also have the ability to run reports on all production data. This capability also allows you to focus on selected work stations to view real time results for both operator and equipment performance.